Get free access to try it. Many college professors find there is not enough time to teach students the grammar, usage, spelling and style they need in order to succeed in college and in the workplace. Newsroom 101 was created to help fill that need. Thousands of students have used Newsroom 101 in courses in journalism, media, public relations and other fields where they need to learn the basics of Associated Press style and the rigorous standard grammar of journalism. You can add Newsroom 101 to any course where students need practice in journalistic style and many aspects of grammar and usage. (Click on Content to see the topics covered in the 2,800+ exercises.) Use it like a workbook or lab where students complete the self-grading exercises on a schedule that you set. 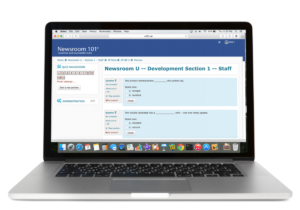 All you need to do is make the assignment and track student progress -- though we describe ways you can integrate Newsroom 101 more fully into your course. All students need is a computer, an internet connection and a browser. Smartphones and tablets also work. Upon enrolling in Newsroom 101, a student pays $24.95 through Paypal and has access for the semester. Your institution can opt to pay for the entire class. If you are being urged to adopt online instruction, Newsroom 101 provides a way to apply student-ready online instruction immediately, giving you time to develop your own resources later. Browse through the menu items at the top of this page. Check out the FAQ. If you are a faculty member interested in trying Newsroom 101, contact us for access. If your students need intensive drill in grammar, usage, spelling, and journalistic style, Newsroom 101 is the way to get it. When you are ready to require Newsroom 101 for your course, just fill out the request form under the Professors menu. We will be happy to set up a section for your students to use and send you the information you need to assign it. Questions? -- Use the Contact form above. We look forward to hearing from you.